The SPOT-NOSED (Single Protein Nanobiosensor Grid Array) project will ultimately result in "electronic noses" to help doctors detect and identify problems by odor. The project was financed by the European Commission's FET (Future and Emerging Technologies) initiative. The nanobiosensors are constructed by placing a layer of olfactory receptor proteins from animal noses on a microelectrod; by measuring the reaction when the proteins come in contact with odorant molecules, the system can detect odorants in concentrations that humans would miss altogether. Two olfactory receptors (ORs) of known ligand have been expressed in yeast (S. Cerevisiae). Both receptors are localised at the plasmic membrane of the yeast cell, and a functional response to the preferential odorant has been measured in the cell. 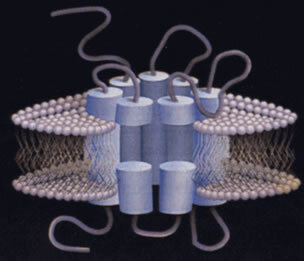 In order to transfer those receptors to the nanobiosensor, nanosomes have been prepared from the cells membrane fraction, with sizes ranging from 60nm to 40nm. A nanobiosensor-based electronic nose would require, at minimum, several hundred different proteins; different proteins react to different odorants. The human nose, for example, uses about 1,000 different proteins to allow the brain to determine 10,000 different smells. This method could lead to a new and quicker way to test for the presence of disease processes in urine, blood, pus or other bodily excretions from patients. In addition, smell technology could sense rotten food, explosives, or drugs. 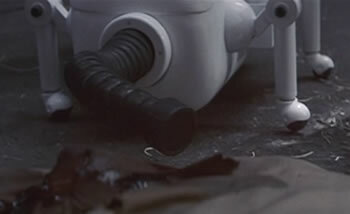 An electronic nose, or sniffer robot was featured in the 1985 movie Runaway, written and directed by Michael Crichton. "It's picking up diphenyl compounds and tetrahydrocarbons. The tetras are explosives and the diphenyls are solid propellant like those used in rockets. How big did you say these missiles are?" I admit that I thought this was far-fetched when I saw this movie in the theater twenty years ago; now I'm not so sure. Those with a nose for odor-related news may enjoy dogs sniff for cancer, the odor alarm clock and the Banryu guard dragon robot. Also, I'd like to recommend this April Fool's Day article on Google AdCense can improve olfactory relevancy. Read more about nanobiosensors; take a look at the SPOT-NOSED website.